In the early 1920's, Stephen Mather, the National Park Service Director, realized that the Park needed accommodations to suit the affluent and influential traveler. The concept of a hotel such as The Ahwahnee became the impetus to draw such a visitor. The site for The Ahwahnee, once a village of the native Miwoks, was chosen because of its exposure to the sun and stunning views of Yosemite's icons � Half Dome, Yosemite Falls and Glacier Point. 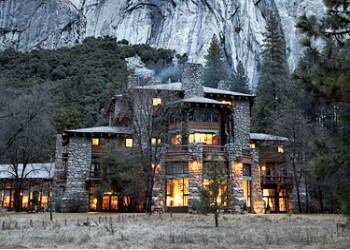 In July 1925, Gilbert Stanley Underwood was selected as the architect for Yosemite's new luxury hotel. Due to its remote location, the construction of The Ahwahnee was the most complex trucking endeavor of its day. Over 5,000 tons of stone, 1,000 tons of steel, and 30,000 feet of timber were hauled over the challenging mountain roads. To protect The Ahwahnee from fire, a fate of many of the Park's earlier hotels, its wood-like facade is actually concrete, poured into rough-hewn wooden forms and stained to look like redwood. 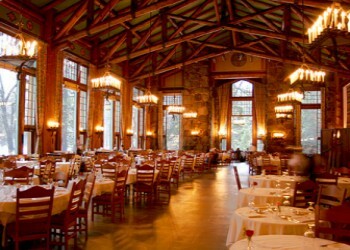 Today, The Ahwahnee is a major attraction to visitors to Yosemite as they explore this unique relationship of architecture and nature. Ahwahnee accommodations include 123 handsomely appointed guest rooms, including 99 hotel rooms, parlors and suites and 24 cottages.